In the summer of 2002 the popularity of dancehall reggae in the US charts reached a new level. I welcomed the debut of songs like Sean Paul’s ‘Gimme The Light’ on BET, but as far as I was concerned my fellow Yankees were late to the party. From that point on a visit to the world music section was always necessary when I stepped in a record store. In August 2002 my mama’s Jamaican friend, Charmas, was over visiting. I was in my room, cleaning and jamming along to a soca-reggae compilation that an ex burned for me. Charmas knocked on my door. 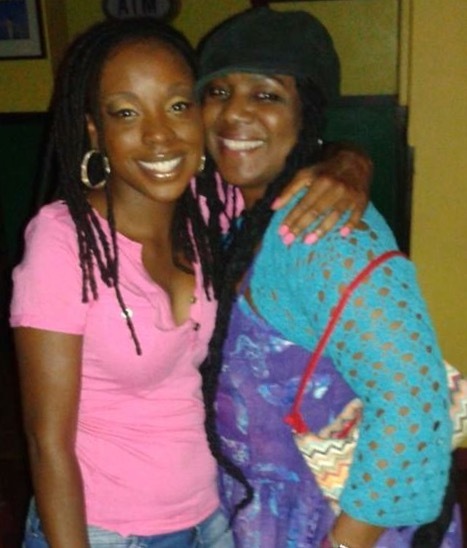 Liming with Charmas for my birthday, August 2015. She recognized my love for Caribbean music years ago and worked to cultivate it. “Do I LIKE reggae? Charmas I LOVE IT!”, I answered emphatically. Charmas’ word was her bond, so for the next ten months I accompanied her at least once a month. Together we went to concerts and reggae nights at local clubs, but our nights at African spots were the best. She knew everyone who worked the door and the bar at those establishments, so in addition to never paying a cover charge we were feted like princesses. When the opening chords play and Wonder begins to croon I see myself at 22 years old. Monday through Friday I’m up by 6am to make it to class by 8am. On my long bus ride from home to school to work and back I listen to Wayne Wonder on my portable CD player. The song captured my optimism and hopes for the young man I was seeing at the time. I had yet to encounter a serious, true heartbreak at the time. As a result I didn’t have the sort of baggage yet that would lead me to be cautious. I dreamed of giving my all to him back then. I was young, naive and deeply infatuated. Wide, open wide in the same sense Jill Scott belts out on ‘Love Rain’. I learned the hard way that getting what you think you want and need doesn’t always end well. And as for the openness, faith and hope in love that my younger incarnation had back then? Well it is quite foreign to me twelve years later. The idea of loving another man the way I loved him-with no reservation, no holding back and no limit to what I would do on his behalf-is an idea that I’m much more ambivalent about nowadays. But I’m thankful that my love of Caribbean music(even when it brings him to mind) has endured. Indeed, sweet reggae and soca have never disappointed and both have a permanent place in my life. Lumidee…. “off-key”… lol I forgot about that! Thanks for the great memories! I don’t know who told her she could sing but they lied, lol!